Before the flaming war starts, allow us to set the context for this BMWBLOG photo comparison. First and foremost, we are the first to state that the following comparison is not only unusual, but somewhat …unfair. The two supercars are fundamentally built on different strategies and core values. While BMW is betting its future on sustainability and efficient mobility, Audi continues to produce supercars that turn heads and attract new customers to the brand. 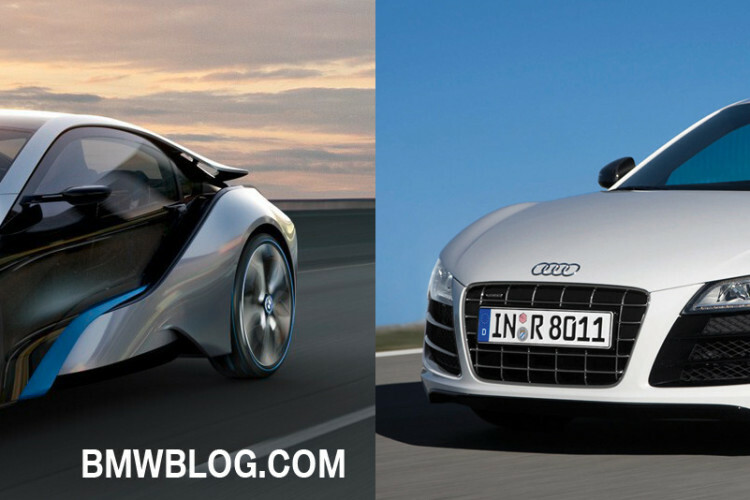 Second, the technology used in the BMW i8 and Audi R8 is entirely different, from engine to chassis and drivetrain. So what do the two cars have in common? The design. This is the common ground since both cars are and will be seen as two super sporty vehicles that cater to those looking for extravagant rides at exotic prices. Through the use of CFRP, the “layering” design principle, with which shapes take on clear functions, adopts a completely new form of expression in the new BMW i8. Due to its exceptional characteristics, CFRP is in itself robust and can be shaped into self-supporting structures. BMW i8 introduces for the first time “layered surfacing”, both in interior and exterior design. BMW design chief Adrian van Hooydonk says “layered surfacing” creates a more cohesive and harmonious appearance while also optimizing air flow. The layering design creates a visual lightness, along with physical lightness, in order to get sporty car performance with very little fuel consumption. Layering is a way of placing things over each other which translates into use of less parts. As the first mid-engine sports car of the Audi brand, the R8 interprets Audi’s design in a new, extreme form: the R8 emerges as a formal statement of sheer dynamism. “Our aim was to create a powerful sports car – but with an exceptional quality of elegance,” remarked Walter de’Silva, Head of Design of the Audi brand group. The design of the R8 makes use of concave and convex surfaces that describe a muscular body. By use of flow lines and surfaces, Audi’s designer adopted the “philosophy of light”. When it comes to power, the two high-end premium cars are far from even being classified as “third degree cousins”. The base 4.2 R8 has a 420 horsepower high-revving V8 engine and all-wheel-drive. It uses the mid-engine Lamborghini Gallardo platform. Furthermore, the Audi R8 5.2 uses a V10 naturally-aspirated engine, still rear-engine/all-wheel-drive with 518 horsepower. The Audi R8 was not built with the MPG numbers in mind, and that’s exactly what you would expect from a car that has performance in mind rather than money savings. At 14-15 mpg fuel average, the R8 is in-line with other supercars from Porsche, Lamborghini, Aston Martin or Maserati. The BMW i8 makes use of an innovative drivetrain, a plug-in hybrid solution that brings together a combustion engine and an electric drive system. Its innovative plug-in hybrid concept combines the modified electric drive system from the BMW i3 Concept – fitted over its front axle – with a high-performance three- cylinder combustion engine producing 164 kW (220 hp)/300 Nm (221 lb-ft) at the rear. The electric motor in the BMW i8 Concept is a full-capability unit which can also power the car on its own. At 349 horsepower and nearly 80 mpg fuel consumption, the BMW i8 runs a 0-62mph in just 4.6 sec – 0.3 sec faster than the M3 Coupe. The sports car has an electronically governed top speed of 250 km/h and space for up to four occupants. In the comments below, let us know which one you would prefer to own, by using the design, engine and technology specs as a benchmark. Audi’s point on entry in the high-end hybrid/electric segment is the E-Tron Concept that uses the R8 as a starting point. E-Tron is powered by four electric motors rather than a gasoline engine. Maximum output is 313 hp and 502 lb-ft of torque. The drivetrain consists of four motors each drive one wheel and can be controlled independently, thus offering torque-vectoring functionality. Audi says 0 to 62 mph takes 4.8 seconds.